CPAP masks are an essential part of the system that allows sleep apnea sufferers to breathe normally and get a good night’s sleep. Here we look at what the latest masks have to offer. Users have had various complaints about the components that make up the continuous positive airway pressure system. Manufacturers have responded with new and improved technology. One common complaint is that the mask can slip and leak while a person is sleeping. A snug seal is necessary to ensure that the air pressure remains consistent. Mainly, this is a problem for the more active sleeper, someone who rolls from side to side during the night. Not only does the broken seal reduce the device’s ability to keep the airways open, it causes a loud hissing noise that wakes the sleeper. Even a slight gap in the seal can interfere with a person’s sleep. For example, air blowing out from under the portion of the mask located beneath the eyes is annoying enough to wake a person from a sound sleep. The solution to the problem of leakage could be “Active Cell” technology. The Active Cell technology was introduced by ResMed, a leading developer of sleep apnea products. The Active Cell CPAP mask frame is more flexible and able to adjust to different sleeping positions without breaking the airtight seal. The technology also addresses other common complaints, such as difficulty cleaning, pressure sores, discomfort and tight headgear. The size of the headgear is another issue that has been addressed lately. In years past, the plastic was thick and heavy, the headgear was large and sometimes uncomfortable, and the appearance was just not that pleasing. Some of the newer CPAP masks were designed to address those issues. The plastic is softer and lighter weight. Lightweight straps have replaced the bulkier headgear without jeopardizing the effectiveness of the nasal-only devices. Manufacturers have even started using colored straps with a more pleasant appearance. For example, pink and light blue straps for women are now available. The newer technology has made fitting easier. In years past, it was necessary to have a technician do the fitting. These newer designs are practically self-fitting. The full-face designs are larger than the nasal-only models, of course. The full-face design is the right choice for mouth-breathers. 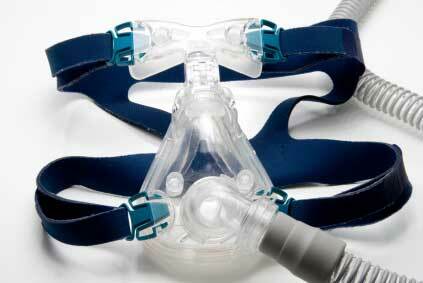 It is necessary to make sure that a full-face CPAP mask seals around the mouth and nose. The nasal-only design works to keep the airways at the back of the throat open. But if the mouth opens during sleep, a couple of different things can happen. First, the air can escape through the mouth creating a noise that wakes the sleeper and the sleeper’s bed partner. Second, as the air escapes, the pressure holding the airways open can be lost. A mouth-breather could start snoring and experience apneas as a result. The latest full-face masks are much smaller than the original designs. Dual straps hold this type of CPAP mask in place, but the straps are less obtrusive than the cumbersome headgear used in years past. So, even if you are a mouth-breather, you can choose a model that is lighter and more comfortable. ResMed, one of the manufacturers responsible for the lightweight designs, reports that 90% of users can get a comfortable fit with their one-size-fits-all model. Once again, this is a new development that makes fitting less complicated. Continuous positive airway pressure breaks the cycle involved in obstructive sleep apnea. The chronic disruption of sleep and the frequent loud snoring comes to an end. If left untreated, there may be an increased risk of numerous health problems due to the low blood oxygen content that accompanies the condition. In order to experience the benefits, a person must continue to use the therapy. The latest CPAP masks make it easier for people to stick with the treatment.